대방광원각수다라요의경(大方廣圓覺修多羅了義經)은 줄여서 ‘원각경(圓覺經)’이라고도 하며, 우리나라 강원에서 4교과의 하나로 채택된 경전으로 불교 수행의 길잡이 구실을 하는 경전이다. 보물 제1518호는 권말에 이색(李穡)의 발문 및 간행에 참여한 명단과 아울러 ‘庚申四月 開版’ 이란 간기가 있다. 이를 통해 이 경(經)이 고려 우왕 6(1380)에 經書比丘 宗昢,云首 등이 필사에 참여하고 志峯, 覺海의 募緣에 의해서 通憲大夫 判司宰寺事 鄭 □□와 咸石柱, 奉常大夫… 少尹 吳稱吉, 檢校中郞將 李元奇 등의 시주로 志道, 禪指, 志祥, 勝海이 刻手로 참여하여 판각된 것임을 알 수 있다. 송나라 효종의 주가 달린 원각경으로 이색의 발문이 실려 있는 고려 우왕 때인 1380년에 간행된 희귀한 판본으로 가치가 높다. Mahavaipulya purnabudha Sutra (The Complete Enlightenment Sutra) has been chosen as one of the four books for basic reading in Buddhist seminaries in Korea. 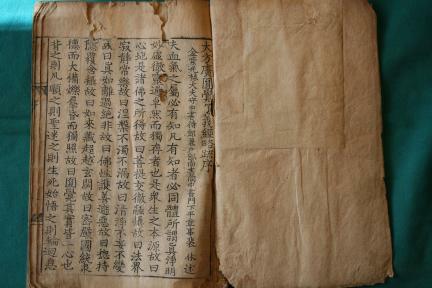 This is a rare edition carrying notes by Emperor Xiaozong (1127-1194) of the Song Dynasty. This Volume contains a preface by Yi Saek (1328-1396), a Neo-Confucian scholar-official toward the end of the Goryeo Dynasty, and a list of people who participated in the publication of the sutra. These records reveal that this woodblock edition was printed in 1380, the sixth year of King U of Goryeo, with blocks carved by Jido, Seonji, Jisang and Senghae, based on calligraphy by sutra-copying bhikkhus, including Jongbul and Unsu. The publication was funded with donations raised by Jibong and Gakhae. Donors included Jeong, Ham Seok-ju, O Ching-gil and Yi Won-gi, all high-ranking courtiers.